Snail Disclosings: This product was gifted to me by Memebox with no request or obligation for review. Nevertheless, I treated it as any other sponsored product for review. You can find my sponsorship policy and reviewing schedule here. Also, one that gives Fiddy what Fiddy wants. These boxes have brought me a lot of happies over the last year and a half. There were many really intriguing items in the box, some of which I’ve mentioned already and some of which I have yet to review. But I was surprised to find that the item destined to take a regular spot in my skincare routine turned out to be a cleansing sherbet from a brand I barely knew. It was actually the last item I even took out and unboxed. 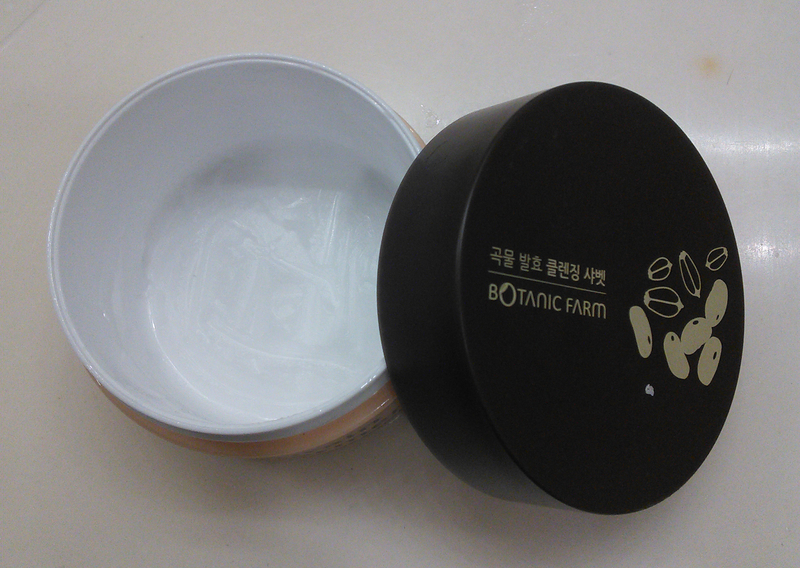 The signature line of Emily Cosmetic, Botanic Farm is one of Korea’s many, many “natural” Korean beauty brands. Though in development since 2010, the brand only launched in March of 2014. Botanic Farm pledges to use no parabens, phenoxyethanol, mineral oil, talc, triethanolamine, or alcohol in their products. While I personally don’t have a problem with any of these ingredients besides talc, as long as they’re at appropriate proportions (as with most substances, the dose makes the poison), I do respect their stance. I also know that many consumers do choose to avoid such ingredients, so for them, Botanic Farm will be an attractive option. Botanic Farm also pledges to use “additive-free” chemical compositions, which means–I think–that whenever they have to use synthetic ingredients, they source the most unadulterated ones they can find. My impression of Botanic Farm thus far has been okay. I enjoyed the results I got from their Syn-Ake black hydrogel mask and all the rest of the Botanic Farm masks I’ve bought from Memebox, but haven’t been impressed by the stiffness and fit challenges of their hydrogel material itself. But that’s the kind of problem that a cleansing balm wouldn’t have, so I put away my half-finished tub of trusty Banila Co. Clean It Zero and decided to try Botanic Farm Grain Ferment Cleansing Sherbet out–and compare its cleansing power to two other cleansing oils at the same time. Purpose: Botanic Farm Grain Ferment Cleansing Sherbet is an oil-based, emulsifying first cleanser, intended for use as a full-face makeup remover during the first step of a nighttime Asian skincare routine. Do not use if: You have a soy allergy or are sensitive to coconut oil derivatives, fragrance, or anything else in the ingredients list. When and how to use: As the first step in your nighttime skincare routine whenever you’ve been wearing sunscreen and/or makeup, scoop out a nickel- to quarter-sized amount of product out of the jar and spread over face. Massage gently for 1-2 minutes. Wet hands and massage again until the oil has emulsified into a thin, milky lather. Rinse and follow with your foaming or cream-based second cleanser. 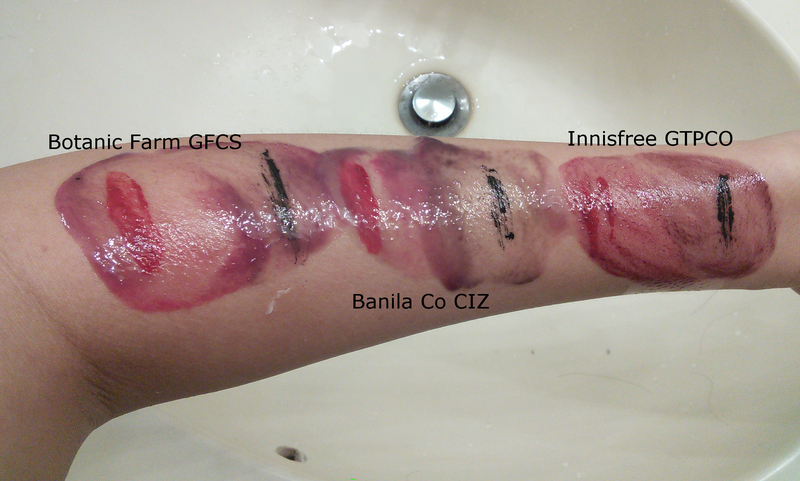 Oil cleansing tip: Got very stubborn makeup to remove? Or is your skin feeling unusually parched after a long day? Try starting your PM routine off on an indulgent footing by spreading your cleansing oil over your face, including eye area and eyelashes if you can handle it, then relaxing for 10-15 minutes before massaging. Notable ingredients: Wait, I thought part of the Botanic Farm pledge was to not use phenoxyethanol. I see phenoxyethanol. Huh. In all fairness, it is the second-to-last ingredient in the list and likely to be present in the tiniest (like, fractions of a single percent tiny), but still. Keep yo’ promises! On the plus side, I like ferments, and Botanic Farm Grain Ferment Cleansing Sherbet has ferments: 100ppm (also a pretty tiny amount but oh well) of sake, rice bran, and soybean ferment extracts. These extracts may provide some brightening, moisturizing, and antioxidant effects, though since this is a rinse-off product, I’m not terribly concerned with the presence or absence of those. 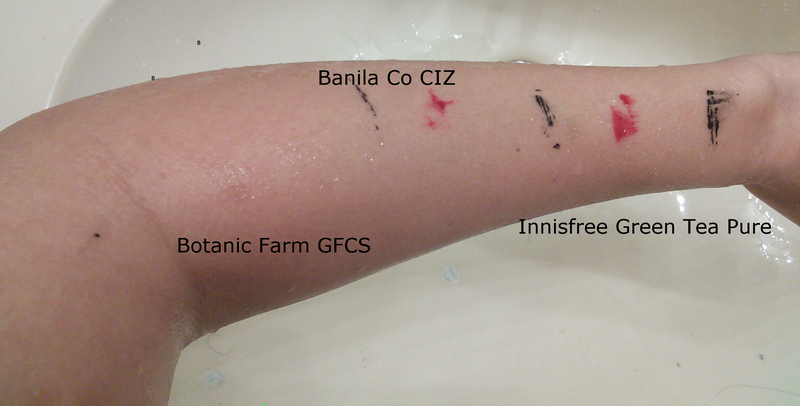 CosDNA analysis of Botanic Farm Grain Ferment Cleansing Sherbet only flags butylene glycol, which, as I’ve said before (and should probably make into an individual post so that regular readers don’t have to hear me say it again), is kind of everywhere. Like any other solid oil cleanser, Botanic Farm Grain Ferment Cleansing Sherbet comes in a sturdy little tub with a spatula included. 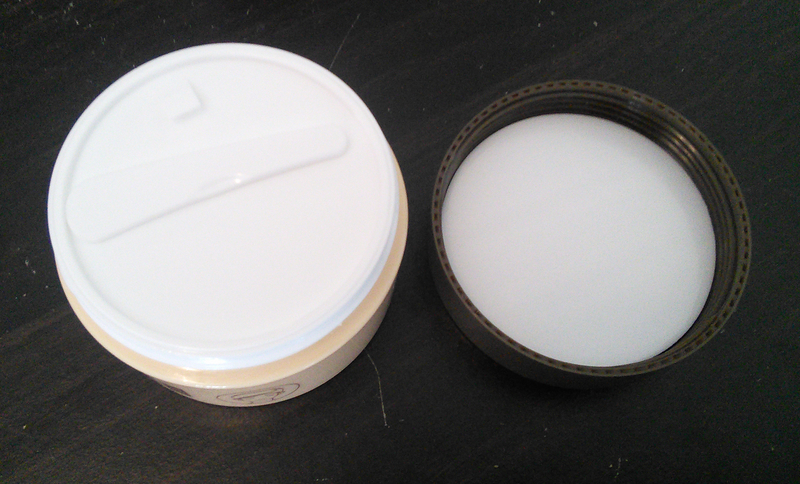 Also a protective plastic inner lid that I always chuck right away, because it’s more hassle than it’s worth. The product itself is a firm, slightly waxy white balm with a subtle floral(?) fragrance. I didn’t want to just describe my experience with this product when I happened to have two other oil-based first cleansers on hand, so what follows is a comparison of Botanic Farm Grain Ferment Cleansing Sherbet, the popular Banila Co. Clean It Zero, and my often-neglected Innisfree Green Tea Pure Cleansing Oil. Oil cleansing tip: Got an oil cleanser that didn’t quite work out for your face? Use to clean stubborn dirt, oil, and grease off of your hands instead of blasting your hands with harsh soaps! In general, your body is a great way to use up products that didn’t make the cut for your beautiful face. The first step was to prep an area of skin with some of the most long-wearing makeup I had on hand. Sorry, no makeup “art” this time. I wasn’t feeling up to doing three different “drawings” or replicating a single one three times. Each section contains a smudge of Revlon Colorstay liquid lipstick (God, this stuff would survive the zombie apocalypse, seriously, and that isn’t always a good thing), Memebox I’m Lip and Cheek stain, Etude House Play 101 gel eyeliner pencil, and Heroine Make Long & Curl mascara (not the waterproof one but might as well be). I then applied an approximately equal amount of each cleanser to their designated sections. The Innisfree Green Tea Pure Cleansing Oil is very runny, as you might expect from a liquid cleansing oil. The Banila Co. Clean It Zero, on the other hand, is a balm like the Botanic Farm, but a slightly softer one with a seemingly lower melting point; it began to soften up and turn translucent almost immediate upon contact with my skin. The Botanic Farm Grain Ferment Cleansing Sherbet, on the other hand, remained firmly…uh…firm. I prefer the firmness. The reason I prefer solid oil cleansers to liquid ones is the mess that I tend to make with regular oil cleansers. They drip and run between my fingers and down my arms and it’s harder to do the “let it soak in for 15 minutes” trick with them. The firmer and less melty the cleansing balm, the better–that’s how I look at it. So Botanic Farm wins this round. I then actually massaged the cleansers in to break up and lift my makeup off of my skin. I added an extra half squirt of the Innisfree, to make up for what I’d lost to runoff while taking the previous picture. Here, the differences between the three products started to become even more apparent. One important aspect of oil cleansing is the richness and slip of the oil. It needs to be rich and thick enough to glide around easily, with enough slip to allow you to massage without irritating your skin by tugging or pulling at it. The Innisfree is quite slippy but very thin in comparison to the Banila Co. and Botanic Farm cleansing balms; as I massaged, I definitely felt that I was massaging my skin, rather than massaging around a quantity of oil. The Banila Co. Clean It Zero proved thicker and provided more of a cushion. But even the Banila Co. couldn’t compare to the Botanic Farm Grain Ferment Cleansing Sherbet, which softened up into a thick, rich, and really luxurious-feeling substance–I’d think of it as a real balm, whereas the Banila Co. melted into an oil. Since I like my oil cleansers really thick and cushiony, the Botanic Farm Grain Ferment Cleansing Sherbet wins this round, too. I then emulsified, forgot to take a picture (sorry, I’m easily distracted and forgetful) and rinsed. Now you can see the comparative cleaning powers of the three oil cleansers I used. Huh. Even I was kinda surprised. Conclusion: The results are clear. 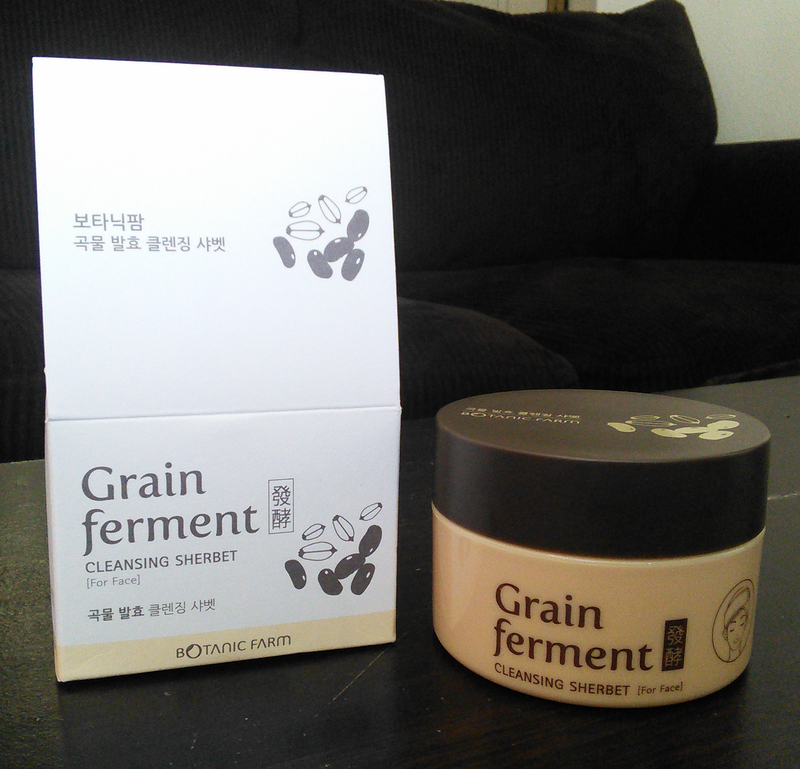 Botanic Farm Grain Ferment Cleansing Sherbet is a really excellent first cleanser that combines some skin-friendly ingredients with a gentle and enjoyable user experience and serious makeup-removing power. I was pretty sad when I finished up my tub. I’m making myself finish up my Clean It Zero and Green Tea Pure Cleansing Oil before I make any more first cleanser purchases. After that, unless something else interesting falls in my lap, I’m going to be rebuying Botanic Farm Grain Ferment Cleansing Sherbet, and I see myself returning to it many more times in the future. Where can I buy Botanic Farm Grain Ferment Cleansing Sherbet? Memebox carries Botanic Farm Grain Ferment Cleansing Sherbet for $24 per 100ml tub (affiliate link). Memebox always has a bunch of discount codes, which I’ve always been lax not only about using, but about sharing. Here are a few I’ve dug up for you. Enter them at checkout. Also, Memebox always ships orders over $30 for free. What do you look for in a first cleanser? Impressive and kinda surprising results! Adds Botanic Farm to the already miles long list. Thanks for the review! I was wondering about this when I was in the market looking for an oil cleansing balm. Of course I went with Banila because it was cheaper (I got mine on sale for $15 shipped) and has such a cult following. The result and the comparison with the other cleansers convinced me! Looks like a product worth to try! Her comments about polyethylene hit home and make me nervous about using them. Do you have any thoughts on this? I love your blog, always full of such great info! I’d been using CIZ Purity for quite a while, but I wasn’t convinced it was irreplaceable. I accidentally found your review and ordered the Botanic Farm cleanser right away. I then went to acquire a tiny stockpile (I hate clutter, but my skin is so finicky with cleansers that I have to have backups of anything that cooperates with it) only to find that in the five, maybe six, days it took to receive it, use it and make sure my skin didn’t freak out, it had gone on sale for $7 (?!) and was consequently sold out. Curses! I was prepared to probably buy two jars at regular price. There’s a small crater in the balm, but I’m already starting to panic even though I have a backup jar of the abandoned CIZP. I’m in Australia and sadly Memebox does not post internationally. Do you know where else I can find this cleanser? Hmm I’ll try to track it down! Hey Fiddy! I was looking at this cleanser and the “official” directions say to just remove with a cloth or tissue, not emulsify and rinse clean. Did you find that this emulsified and rinsed clean for you? I have oily, clog-prone skin and I can’t imagine using something that didn’t emulsify and rinse cleanly. The directions say that it leaves a “slightly oily finish behind that hydrates the skin.” Ahh!! I know it in your review you rinsed it and whatnot, but did it emulsify for you like any typical oil cleanser would? Did you feel any residue or oiliness left behind?? Thanks! This emulsifies and rinses fine for me. That’s super odd that the official directions are to wipe it off like a cold cream…I just can’t see that being a good thing to do! I wonder what happened there. Hey Fiddy, just discovered your blog! Thinking of getting this based off of your great review, but how do you feel about its cleansing power for your pores? Does it do anything to melt away those clogged pores? FYI for Costco members: Costco online has a package of TWO 100 ml tubs PLUS a 0.3 ml travel size for $26.99, shipping included. Costco tends to have high turnover on what it carries at any given time, so not sure how long this deal will last. I was surprised to see quite a few “k-beauty” items at the Costco online site. Who knew??? Oops! That should read 10 ml travel size (0.3 oz.). Shipping and handling included. Here is the info from Botanic Farm, posted at the Costco website. A little bit different from the info on the Grain Ferment (U.S.) website, but close. Both say nothing about emusifying, but rather to wipe off. And both say ALL ingredients grown on their farms. ??? At Botanic Farm, we believe in going green and protecting the environment. That is why, the ingredients used in our products are grown on our farms. Our products are made from natural ingredients. Apply a pea-size amount of sherbet and massage into skin to melt makeup. Use a cotton round or tissue wipe away makeup and impurities. Follow up with a foaming cleanser or massage into skin for added moisture.